According to Charles Darwins’ Origin of Species, “It is not the most intellectual of the species that survives; it is not the strongest that survives; but the species that survives is the one that is able best to adapt and adjust to the changing environment in which it finds itself”. This probably is one of the best bits of advice to give to a salesperson too, when they are dealing with business in today’s environment. Well, nothing is as consistent in business as change. It underrides every fundamental in every company today. If they don’t keep up with change, then they simply get left behind. So, how can Darwin’s quote help us to achieve more? The fact is that every business you deal with every day is going through change. Some are experiencing change that is being thrust upon them; some are coping ok with the changes they face every day; and some are driving change successfully so that they succeed where others fail. A key component required here is the ability to see the repercussions of change on your customers’ businesses as quickly as they do, if not quicker. If you have that ability, you give clients reason to listen to your recommendations and suggestions for improvement. Your competition will try and sell the products and services they have. That’s all well and good if they are just in transaction mode. Those products may work well enough for their clients to try them, buy them and use them. 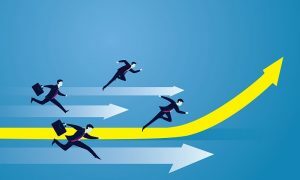 However, for companies to thrive in today’s world, there has to be a certain unique element that sets them apart from the competitors who simply sell products. And one of the best ways to keep ahead of your competition is to highlight the effect of change on your customers’ businesses. That way, you are building a good reputation based on advice and quality recommendations. Identify for your customer how the changing market is affecting their business. Help them adapt to those changes by using your products and services. Become the company of choice by utilising the abilities of your products to keep your customer ahead of the game. Change really is the only constant. Helping your prospects adapt to those changes ahead of their competition will make you a valuable asset to them and will help you build a reputation for driving performance forward. This will take the emphasis off price and develop a sense of reliance on your company, because you prove yourself to be better than the competition in the long run.